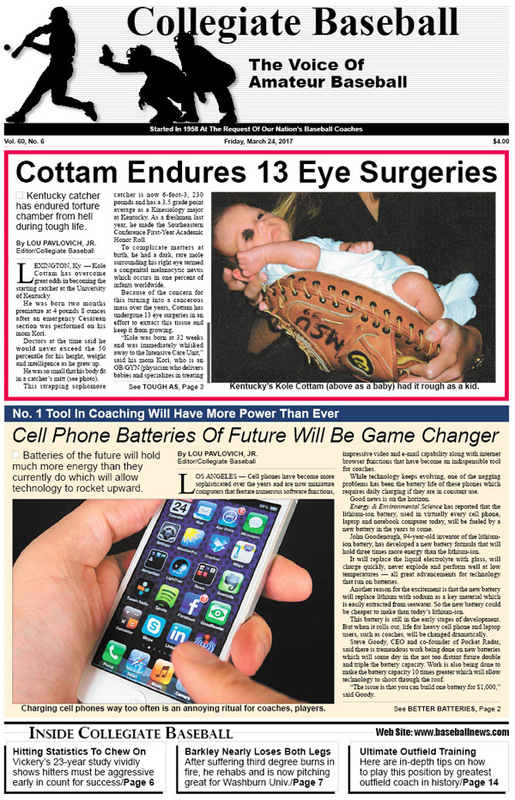 • Special Report: Kentucky’s Kole Cottam endures torture chamber from hell with 13 eye surgeries. • Future Of Cell Phones: Batteries of future will hold much more energy which will allow technology to rocket forward for baseball. • Editorial: NCAA suspension of players was absolutely ridiculous. • Danger Of Chewing Tobacco: Former Georgia State skipper Mike Hurst suffered greatly with throat cancer. • Art Of Coaching Outfielders: In-depth advice given by fabulous Major League coach Sam Suplizio in this special 2-part series. • Ruleball With Rich Marazzi: Type B obstruction plays discussed at length which makes everything crystal clear. • NAIA Notes: Oklahoma Wesleyan’s Chris Tapia hits for cycle, among many noteworthy items. • 23-Year Study Doesn’t Lie: Steve Vickery vividly shows how vital it is that batters hit pitches before getting to 2-strike count. • NCAA Division 2 Notes: Lance Barkley of Washburn University nearly loses legs in bon fire gone wrong, among a host of other interesting items. • Collegiate Baseball’s NCAA Division I Poll Presented By Big League Chew: Oregon State No. 1 with glistening 14-1 record, 1.20 ERA. Read about the other top 30 teams and extensive notes. • Collegiate Baseball’s National Players of The Week: Four pitchers strike out 15 batters while three hitters belt 4 home runs with multiple RBIs, plus other amazing achievements. • NCAA Division I Notes: Wild game between TCU and Texas A&M produces a combined 46 strikeouts in 15-inning contest which is second highest strikeout total in NCAA history. • Charlie Greene: Important fielding technique introduced that will help infielders. • Junior College Notes: NJCAA Hall of Fame class includes Bo Hall (Cochise College), Craig Young (Middle Georgia State, Abraham Baldwin) and Roger Bidwell (UConn Avery Point), plus many more junior college notes. • Collegiate Baseball’s National High School Poll: Archbishop McCarthy H.S. (Southwest Ranches, Fla.) kicks off the season with 7 straight wins. See the rest of the top 30 and read extensive notes on all the ranked teams. • NCAA Division 3 Notes: La Verne’s Christopher Arcos fires no-hitter during 10-0 win over Claremont-Mudd-Scripps, in addition to extensive notes on NCAA Division 3 action across the nation. • Jack Dunn: With runner on third, 1 out, what would you do defensively? To purchase the March 24, 2017 edition of Collegiate Baseball or subscribe, CLICK HERE.